Backblaze (a TidBITS sponsor) has posted a support article outlining the steps that users must take in macOS 10.14 Mojave to grant full disk access to the backup company’s Mac client. 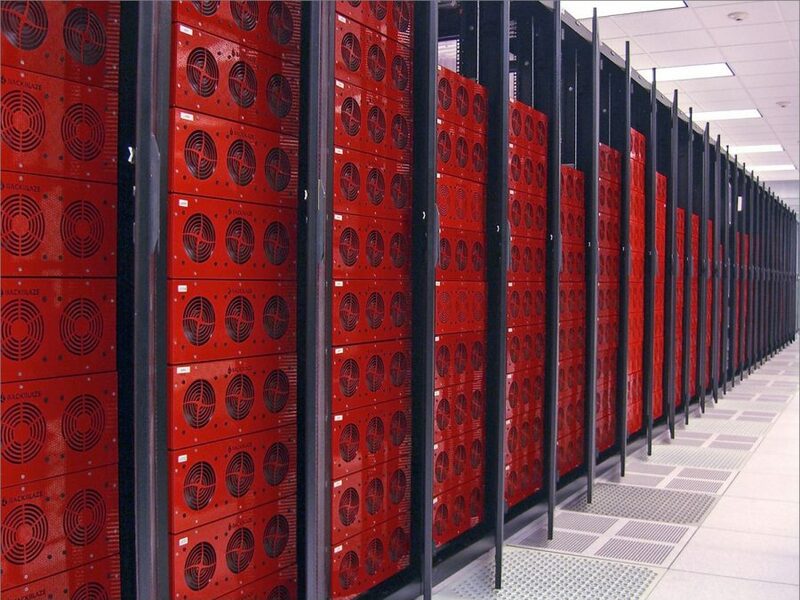 Backblaze needs full disk access to access all the files necessary for it to complete its backup tasks. You’ll also need to update Backblaze to enable its menu bar icon to work in Mojave. Both cases are related to Mojave’s tightened security and privacy preferences—for details, see “Mojave’s New Security and Privacy Protections Face Usability Challenges” (10 September 2018). We anticipate that Backblaze will release an update that will explicitly request the necessary permissions soon. If you haven’t yet upgraded to Mojave, this is another reason you might want to delay the installation. still current for now? I see that there’s a fix for the menu bar icon. Yup - still the current steps. The new client update fixes the menu bar issues, but there’s a manual step as well if folks don’t update (bottom of that Mojave FAQ). I contacted Backblaze support and they also pointed me to that article. The steps were easy to follow, and after implementation the warnings about certain things not getting backed up went away. I suggested they send out a newsletter to all users with the instructions. There are also instructions from Carbon Copy Cloner needed to grant extra needed permissions. Doug - We just sent an email blast to everyone with NEW instructions (so make sure you follow those please). We didn’t want to do a mass-mail with the last version b/c it required some cumbersome unpackaging. The new Backblaze version though makes the process a lot simpler! We’ve recently just updated the app/client with a much simpler fix and have update that page. The long and short of it is, people have to do this again even if they’ve already done the previous process (we had to essentially repackage the app) but the new instructions make it very simple and new installations on Mojave should flow much better! Should we remove the bzserv item we added to Privacy when following the previous process? Hi Doug! Up to you - it’s not detrimental either way. But for cleanliness sake, we’d say recommend removing it! Does anyone know if Arq has the same problem (and solution) under Mojave? I just did a test restore of file that were backed up before I granted that access - it restored just fine. 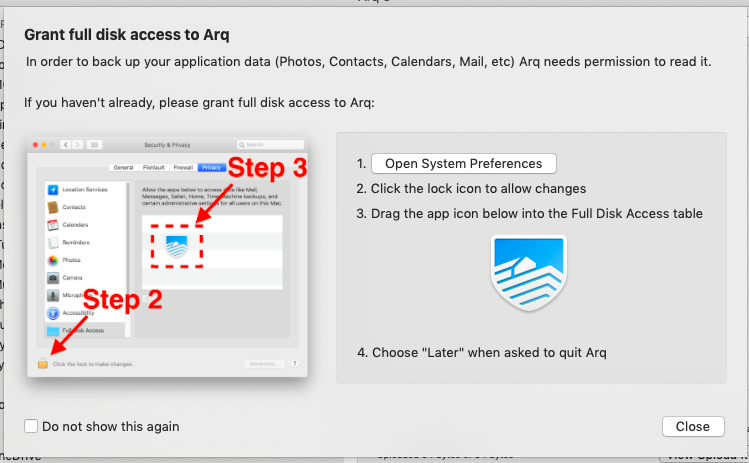 Regarding your test, I’m not sure Arq needs that access to Restore any files, but it probably needs it to back them up, especially based on the wording in your screenshot. The fact that it prompts is a good sign. A real test would be changing some file outside of its sandbox (which is what?) and see if that gets backed up. Them well know for sure it can back up everything. I don’t think so; I think it is for restoring files. I installed Mojave early last week, the file was backed up last Friday, and I just allowed access to Arq when I made that post. Interesting. And odd considering the wording. I take it back: reading up on this, for Arq, it is for backing up. The reason that my system was backing up before I granted full disk access is that I was testing folders that aren’t protected I believe. In that case, it’s not good that Arq didn’t ask you for that permission until now. What has it been doing since you upgraded to Mojave? Silently not backing up your files? Not good! In any case, I appreciate the heads up offered by this entire thread. I will have to remember to check this when I feel safe enough to upgrade my main Mac. It’s frightening to me that these backup companies’ software developers apparently had no idea that their products were completely failing silently until they discovered this issue, seemingly from hearsay. Aren’t they reviewing security bulletins or API alerts from Apple? I wouldn’t put it past Apple to have been fairly silent on the change. But the backup software vendors should have regression testing scripts that run detailed audits of backups to confirm everything is backing up, and a major new release of the OS would appear to be a good time to run such a regression test. (I even whipped an audit like this together using a shell script to prove Time Machine was not backing up critical user data). Okay, now go back to be and rest peacefully knowing your data is in good hands.